A different style of Index boards that we come to know and love. Helping reduce cross-contamination of different food types with this clever bamboo chopping board set. 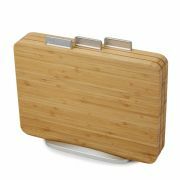 Each board has a tab to indicate which food type it should be used for, raw meat, cooked food or vegetables all complete with a sturdy metal storage stand. Each bamboo board is made from tough, natural bamboo.